KEITH RICHARDS Autographed Signed ROLLING STONES Guitar RACC! 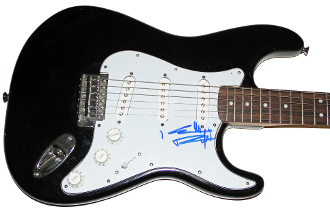 Our Products >> KEITH RICHARDS Autographed Signed ROLLING STONES Guitar RACC! This is an authentic Keith Richards signed strat-style Squier Fender guitar. Keith signed this particular guitar in New York City in February 2015. The signature is solid and was signed by Keith Richards, using a blue permanent felt tip. This guitar signed by Keith Richards is guaranteed authentic and comes with my (LOA) Letter of Authenticity that carries a lifetime guarantee for this item and states the date and place Keith Richards signed. If you have any questions feel free to email me. Thanks for visiting and be sure to check out my other authentic treasures for bid.